Protective devices — intrusion detectors, fire detection, alarm systems and cameras slaved to a closed-circuit TV (CCTV) system — can be an important (and sometimes costly) part of an institution’s security system. CCTV coverage may also be useful as such systems permit surveillance of exterior exits and interior halls by one trained security officer at a master console. However, even the most sophisticated and costly devices are limited by the human factors involved. The best CCTV system will be ineffective if it is not properly monitored or if those tasked with monitoring the cameras are overworked, poorly trained, tired or distracted. Additionally, most institutions are unlikely to have the resources for continual monitoring. An alternative is a videotape system, but here, too, the best video surveillance system will fail when not properly used, e.g., when no one is assigned the job of checking, reviewing and changing the tapes. Surveillance cameras should be conspicuously placed at the entrance points to your institution to act as a deterrent to potential intruders. 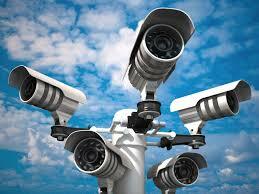 Cameras may also document criminal acts that may occur on your property. This documentation can be used to identify and prosecute perpetrators. Although expensive to purchase initially, these cameras generally prove to be economical when compared to potential loss. Use a wide-angle lens to survey entrances. Consider using cameras that employ infrared illumination to enhance nighttime video or provide adequate lighting. Couple the camera with a time-lapse recorder for permanent recording.